Seat 31B Is Being SSSSed! What does this mean? Possibly nothing. Sometimes people are randomly selected for additional screening. Lightning could have struck twice. On the other hand, it’s possible that my frequent and unusual travel patterns (at least, unusual for anyone who isn’t a travel blogger) have aroused the suspicion of the TSA. Or maybe it’s the destinations I’m visiting. After all, my last two trips have been to Turkey and Dubai. I did enter my Global Entry number both times, but was still selected for additional screening. What is involved in additional screening? More time and hassle. You don’t get access to PreCheck or any expedited screening. What’s more, the TSA takes you aside after your regular screening, goes through your bag manually, and takes several test strips to run through a machine. You’re also required to undergo a thorough manual pat-down (the same one that they give you if you refuse to be screened by the machine). Eventually, they will stamp your boarding pass and you’re allowed along your way. In case you slip through, your airline double-checks for the TSA stamp on your boarding pass to ensure that you have gotten the additional screening. And if you’re traveling *into* the United States, it’s even more hassle. You’re separated from the rest of the passengers at the gate, everything you have is manually searched, you’re manually patted down (and your shoes double-checked), and you’re finally let on the plane. At least you get early boarding as a bonus, though; this is done to ensure you don’t mix with anyone else in the terminal. The TSA has a redress program. 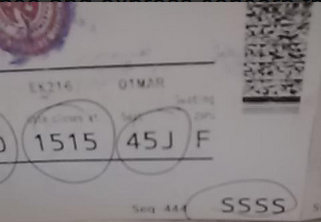 Shortly after 9/11, I was constantly getting flagged with SSSS. I have a very common name, and apparently one of the thousands of people who share my name is on some sort of watch list. I participated in the redress program before, and the problems magically stopped. So, I’m not sure whether this is a recurrence of the previous issue, or something else. I have submitted an inquiry with the TSA, and hopefully the issue will be resolved soon. Update: I’m definitely “on the list.” I suspect this happened because I traveled to Turkey via a circuitous route–the sort of route that would only be taken by either a shady character or someone trying to use frequent flier miles. It’s not unusual for me to be questioned by border agents about my unusual travel patterns (which are either a result of crazy routes I have to take in order to fly on points, or routes I’m flying because of mistake fares), but it’s definitely the first time I’ve apparently been put on a watch list as a result of this! On Tuesday night, there was an incredible deal to India on Emirates. How incredible? $450 roundtrip from Los Angeles to Mumbai. There were even better deals, including $258 roundtrip from Los Angeles to Hyderabad. Deals were available from most North American cities served by Emirates. However, they could only be booked on Vayama, who has a fairly unusual procedure for issuing tickets.This ultimately torpedoed my trip, along with everyone else who booked these low fares. We recently received your online booking request. Quality control has determined that your booking could not be processed at the fare that was originally quoted. Unfortunately, the airline was unable to accept the fare that was quoted earlier and as a result, the fare is increased now. This was an issue from Emirates Airline due to fuel surcharge was not updated on the ticket price. Hence we would suggest you to either cancel this reservation or accept the below fare. We are doing this to avoid any kind of problem at the airport. please respond to the email or call us on 1.877.628.6452 at the earliest convenience if you agree to pay the new fare, so that we will go ahead and issue your ticket. If you have any questions please feel free to respond to this email and we will get back to you generally within 24 hours. What was the root cause here? You have to have both a reservation and a ticket number in order for the contract to be complete. Vayama, for whatever reason, makes a reservation immediately upon booking, but manually processes ticketing. They likely do this to avoid fraudulent credit card charges. If an airline decides that a low fare was a mistake, it’s very easy for them to back out of the deal in this scenario. No ticket was actually issued at the time of purchase, hence there was no Contract of Carriage. So, Emirates didn’t legally have to honor the deal–and they didn’t. I will have to visit India another time. UPDATE: I just received a phone call from Vayama indicating that Emirates will honor the fare after all. However, the ticket that was issued was a very heavily restricted ticket which is the same category issued for frequent flier tickets. This means that it likely will not earn mileage with Alaska Airlines Mileage Plan. However, at a 50% discount from the usual lowest fare, it’s still a very good deal to visit India.